NSW is experiencing one of the most severe droughts on record, with the Central West, Far West and North West regions the worst affected to date. In the Barwon Darling, the river has ceased to flow for an extended period of time. This is causing significant social, economic and environmental impacts. There have been extreme low inflows (the amount of water entering the Barwon River) over the last 6 years except for a period of 6 months during the second half of 2016. The lack of inflows to the Barwon Darling is a result of extremely low inflows to the tributaries upstream with the drought having significant impact on the northern rivers. The Barwon Darling is an unregulated river and customers extract the water when the river is flowing above set levels. They then store the water onsite for irrigation of crops. There has been limited opportunity for irrigators to extract water in the Barwon Darling over the last two years with flows in the system below extraction set points. There has been no extraction by irrigators from the Barwon Darling in 2018/2019. This drought is a natural disaster. Significant rainfall is required to wet up the catchment before we will see improved inflows. Without imminent inflows, the lack of water will continue to impact water quality and the riverine environment, while curtailing agricultural production. Community members and stakeholders from the Barwon Darling met in Walgett to discuss the latest drought outlook and water management options being planned by the Department of Industry and WaterNSW. While water storage in the Barwon Darling remains at critically low levels, we will update you as news comes in via our media releases and water operations updates. 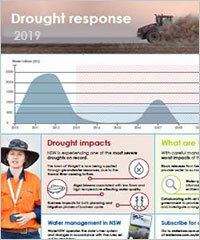 This will be in addition to our weekly Regional NSW drought report.